We are hosting our ANNUAL FREE ORAL CANCER SCREENING at Beach View Family Dental; now located at 9072 Lorraine Rd. Gulfport, MS 39503. April 27, 2018 at 8 am until approximately 12 pm. The free screening is open to the entire public - you do not need to be a patient. You must have an. Lumps, bumps or sore spots on the head or neck or discomfort in the mouth and throat may be early symptoms of head and neck cancer. 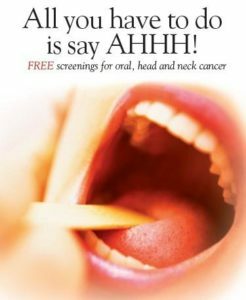 The Vanderbilt Department of Otolaryngology-Head and Neck Surgery and the Vanderbilt-Ingram Cancer Center encourages everyone to undergo screening for early detection of head and neck cancer. The screening sessions.